The Kalachakra Effect — Why is the Kalachakra Initiation So Popular? Once every couple of years, news and social media light up around the world with images of the red-robed Dalai Lama seated upon a high ceremonial throne amid a sea of devoted followers and captivated audience members. This newsworthy and popular Buddhist event is the Kalachakra initiation, which has become something of a hallmark of His Holiness the 14th Dalai Lama as the religious gathering has enjoyed an undiminished popularity over the last six decades. Arenas filled to bursting with well-wishers and devotees have earned the self-proclaimed “simple Buddhist monk” quite the rock star status. 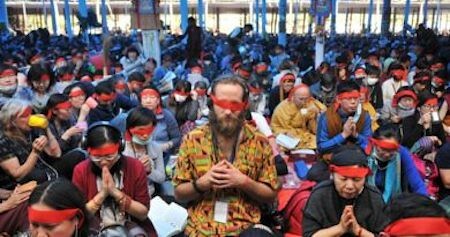 At the start of this year’s event, a multitude of Vajrayana Buddhists and fans of the Dalai Lama from around the world converged on the holy site of Bodh Gaya in India to attend the “34th Kalachakra Initiation and Teachings” that began on 2 January. Ever since His Holiness began giving Kalachakra initiations in Tibet in 1954 and 1956, the event has attracted large congregations. When given in India, the numbers are similarly immense, as it is a convenient location for both Tibetans in exile and Asian Buddhists. The very first Kalachakra initiation was given some 2,594 years ago in southern India by Shakyamuni Buddha, who attained enlightenment in Bodh Gaya. Receiving any kind of Dharma blessing or teaching at such a sacred place is thus considered especially auspicious. Since the beginning of the tradition, initiations have been passed from teacher to disciple in an unbroken lineage extending to the Dalai Lama in the present day. Receiving an initiation or empowerment, and subsequently accomplishing a practice as given by a realized master of an authentic lineage is a pinnacle of spiritual endeavor for Vajrayana Buddhists. Upon request, His Holiness has given the initiation 34 times in his life, 10 of which were held in the West, starting in 1981, when the Kalachakra took place in Wisconsin. The series of empowerments is so sophisticated that only a fraction of the multitudes present can truly receive it. Whether or not one can depends on one’s level of preparation and motivation, though anyone present is certain to receive blessings. During the three principal days of the empowerments to the highest yoga tantra class, His Holiness leads the initiates through complex visualizations that require the ability to grasp emptiness, in addition to a special kind of concentration achieved through prior experience with meditation. Having dissolved ordinary appearances and concepts into emptiness, one’s self, the surroundings, and the master, are experienced in their pure form as the deity within its mandala. Received within this frame, the empowerments act as a catalyst for the transformation of the mind’s energies. Having thus received the initiation and associated vows, the disciple continues to accomplish the practice, with the aim of total transformation of the mind and, ultimately, enlightenment. Shakyamuni Buddha’s original exposition was later recorded as a tantric text containing explanations and meditation instructions aimed at leading the practitioner toward the ultimate goal, perfect enlightenment. The Cycles of Time tantra addresses the phenomenon of time, experienced by unenlightened beings as a never-ending stream carrying their lives forward through aging towards death. Time is categorized into three cycles: the alternative cycles deal with ways to defy time as a life-destroying force, otherwise known as impermanence, the very nature of samsara. The outer cycles of time are external cycles the universe goes through and are a basis for ancient cosmology, which inspired Tibetan astrology and calendar making. The inner cycles relate to the physiological and mental cycles of the body, which form a basis for Tibetan medicine. 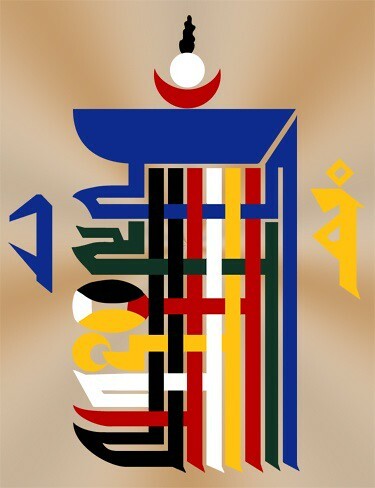 In this way, the Kalachakra has been integral to Tibetan culture and science since it reached Tibet 1,000 years ago. The relevance within the Tibetan context is obvious, but what has the Kalachakra to offer the rest of the world? For one, this ancient scripture baffles modern science. It offers a strikingly sophisticated presentation of the universe, with a description of atoms and sub-atomic particles that have a surprising correlation with modern theories of particle physics. His Holiness has discussed these parallels in meetings with scientists, and there are suggestions that the space particle presented in the tantra may be equivalent to the famously elusive Higgs boson. Despite the incredibly sophisticated and multilayered technical content, the Kalachakra has not put people off. Quite the contrary, one of the main reasons for attending is the social aspect of the occasion; Tibetans have traditionally enjoyed religious gatherings as an opportunity to socialize. For foreign participants, it is a venue where they can meet like-minded practitioners and share in the generation of positive collective merit, while bathing in the Dalia Lama’s charismatic presence. Recognizing the social function of the initiation, His Holiness uses any opportunity to preach his universal message of love, compassion, and peace to the world beyond his flock. When the Washington event was titled “2011 Kalachakra for World Peace,” it served as a platform for a discussion on His Holiness’ famous message of peace, inviting the general public to attend this ancient ritual. The Kalachakra has also given the West the notion of Shambhala, or Shangri-la. The myth of the Shambhala pure land, an important part of the tantra, was singled out at the start of the 20th century to inspire fanciful theories, which led to a hopeless search for a hidden land that could be exploited. It later went on to fire the imaginations of the followers of the New Age movement of the 1970s, thus making the notion of Shambhala as a perfect spiritual land part of popular Western culture. The actual meaning, according to the teachings, is that Shambhala is a level of spiritual attainment rather than a physical or celestial place. Assumptions based on such popularized misconceptions make the Kalachakra a likely subject for misinterpretation. Similarly, the esoteric atmosphere of the distinctly Tibetan Buddhist ritual itself, with its trademark sand mandala construction, chanting, masked dances, deity depiction, and the symbol of the mantra can easily be misinterpreted within the context of an entirely different sociocultural, historical, and religious background. Owing to authentic teachings being notoriously scarce in the past without preliminary study, the ceremony could easily be confused for a great mystical show. But with more reliably sourced information made widely available in modern languages in print and digital media, earnest candidates are well equipped to appreciate the real meaning and potential of the Kalachakra and to make the most of the initiation experience. Originally, the Kalachakra Tantra, similar to many other ancient Indian Buddhist texts, found its way to Tibet, where it was saved from extinction and practiced for some 1,000 years. With time, these practices adjusted to and subsequently permeated the unique Tibetan culture, ultimately proving their absolute value through producing living examples of realized Tibetan practitioners. The Buddha’s intention is to benefit all sentient beings beyond the constraints of time, space, and culture. Despite its esoteric feel and cultural baggage, the unfading global popularity of events like the Kalachakra prove how relevant these ancient treasures are for today’s spiritually and morally deficient societies, by showing us possibilities beyond shallow materialistic goals and stifling consumerist self-expression. Ultimately, the objective is to emulate the Buddha in following a wholesome path to achieving the perfect freedom of enlightenment for the benefit of fellow shackled beings. With thanks to Khenpo Sonam Tsewang for his expert advice and factual accuracy check.